Few things in life are more refreshing and healthy than an ice-cold glass of rust orange metallic tasting water… You need iron in your diet, but not quite like that. Here is some useful information about how iron gets in your water, potential hazards of it being there, and how to test for it. How Iron Can Get into Your Well Water? Seepage: Water from above the surface in the form of rain or melted snow travels through the soil into the well’s water supply. Along the water’s path, iron within the soil may dissolve into the water and follow it into the well. Corrosion: Remember as a kid when you accidently left your bike outside in the rain and woke up to find it a rusty mess? Something similar can occur within your well causing iron to enter the water. The casings and pipes leading to and from the well are likely made of iron. When they are exposed to water and oxygen the iron can begin to deteriorate, causing the iron to oxidize, and form the natural by-product rust. As water travels through the pipes the rust flakes off into the water supply and subsequently into your tap and appliances. What Are the Different Forms of Iron? Ferric Iron “Red-Water Iron”: That lovely orangey-red water mentioned in the beginning of this article, is Ferric Iron. Ferric Iron is clear well water that has been exposed to oxygen, oxidized forming visible rust, giving the water a reddish color. Ferrous Iron “Clear-Water Iron”: This form of iron cannot be seen in the water because it is soluble, or can be dissolved in water. Ferrous Iron often comes from deeper wells or water sources. Ferric and Ferrous Iron can easily be confused so the best way to remember the difference is their endings. Ferric ends in “I-C” because it is the iron you can see. Are There Any Health Hazards Caused from Having Iron in My Water? If you have concerns about iron in your water supply, while it can be damaging to your water system and appliances, serious effects on your health are unlikely. Iron is an essential component of the human diet for proper function and it is highly improbable that you would consume a toxic amount solely through drinking water. However, excessive iron in water may have negative effects on your hair and skin. Well water often contains high levels of iron and other minerals. Once absorbed by your hair, these contaminants will cause your hair to develop a darker discoloration and become dry, brittle, and have an awful metallic odor. Heavy amounts of iron will tint light-colored hair orange and cause dark hair to become darker with red highlights. In addition, oxidized iron actually functions similarly to how a mild peroxide attacks the hair. It may cause an excessive dry feeling in your hair and could even change your hair’s visible texture. In regard to your skin, iron can damage skin cells which may lead to wrinkles. In addition, dissolved minerals such as iron and magnesium will cause excessive soap scum residue, clogging your pores, and leaving you with unattractive skin problems such as acne or eczema. More serious health consequences may result from iron bacteria, which are microscopic organisms that feed off of iron. These creatures can leave behind iron waste, a gross slime that can stick to pipes and create an environment that harbors other harmful bacteria and organisms. The EPA has not listed iron bacteria as a contaminant. However, the EPA does list iron as a Secondary Drinking Water Contaminant because the pathogenic organisms, which require iron to grow, increase the risk for disease or infection when digested by humans. What Damaging Effects Does Iron Have in Well Water? There may not be any consequences to your health from the iron present in your well water but your appliances, dishes, laundry, and food will definitely pay the price. Stains and Slime: One of the annoying repercussions of iron in well water are the stains it leaves behind on your laundry, dishes, sinks, and bathtubs which are nearly impossible to remove. The stain will appear in a red, yellow, or brown color making all of those items look gross and unsanitary no matter how hard you try to clean them. Clogged Pipes: Sometimes when rust particles and iron fragments travel through your water supply they stop for extended periods of time. Once stagnant, the iron is able to accumulate inside the pipes of your water supply system as well as your appliances. This can result in the need for expensive repairs in your dishwashers, washing machines, sprinklers, and other water-related appliances. Foul Taste and Smell: If you are trying to impress your date or spouse with your culinary talents make sure you address the iron problem first. Iron in water will make even your best dishes and drinks have a disgusting metallic taste and a repulsive dark black color. This problem is especially prevalent with vegetables and other foods cooked in water. How Can I Test for Iron and What Are Acceptable Iron Levels in Well Water? If you are looking for an easy to use method to test for iron with accurate results ITS has you covered. 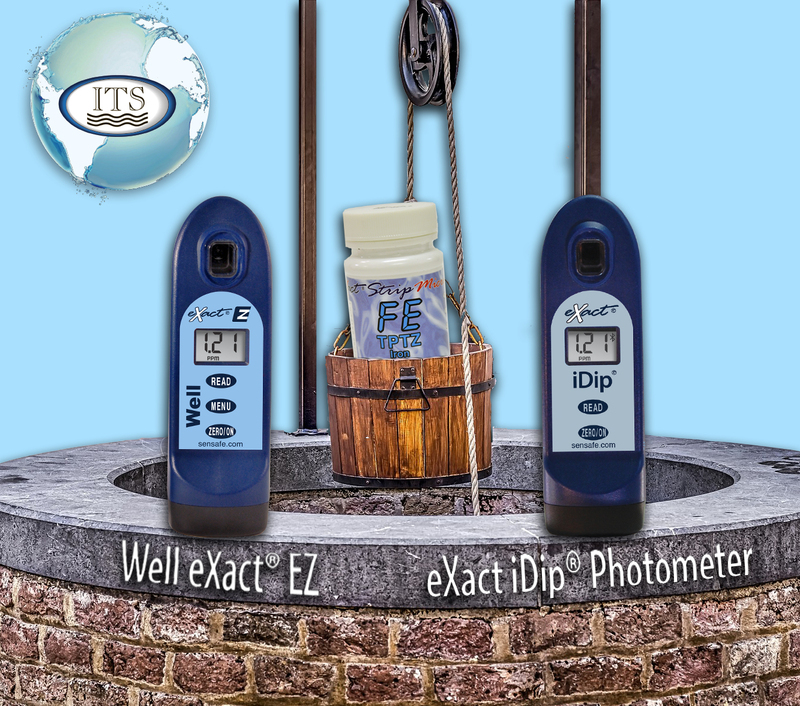 In only 30 seconds the Well eXact® EZ and eXact iDip® Photometer will provide you with precise, quick, and easy results. Once you decide on your testing device, the next step is to understand what levels of iron are acceptable to have in your well water. As mentioned earlier, the EPA lists Iron as a Secondary Drinking Water Contaminant with a maximum contaminant level of 0.3 mg/L. According to the Minnesota Department of Health, “a milligram per liter is approximately equal to 1 part per million (ppm).” Having levels above .3ppm of iron will increase the likelihood of seeing damaging side effects to your appliances, clothing, dishes, and food.